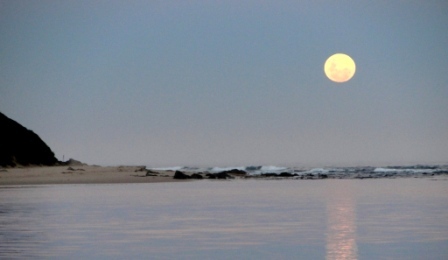 On my previous trip with John X Safaris, I traveled to Mozambique. It was full of adventure and excitement. While I have been to South Africa many times, the adventure and excitement never stops. 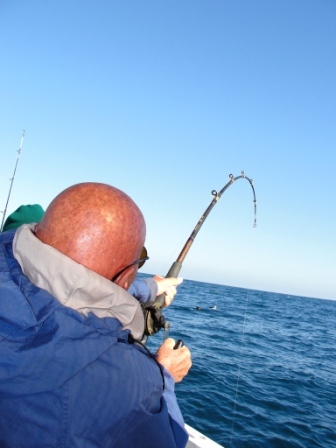 On my last trip, once again, we went fishing in the Indian Ocean. Our party got into yellow tail tuna. That fish fights like no other I have hooked. 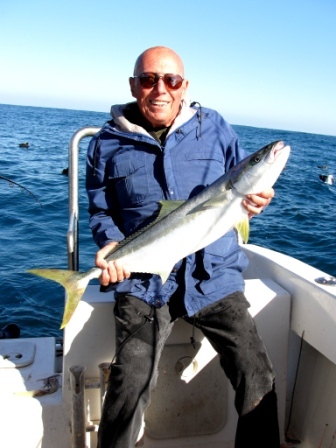 No, they were not the largest tuna ever caught, but they were the first for me. I was able to share this adventure with my PH, Carl van Zyl, his close friend, Jose H. Gomez, from Mexico, Rick, Carl’s father and a couple other new friends. We fought and landed a boat load of tuna. Most were given to friends or locals. That evening, Carl, Jose, and Rick prepared a meal of sushi, ceveche, and barbequed blackened tuna. As I write this story, my mouth is watering thinking of that fantastic dinner. Thanks, guys. 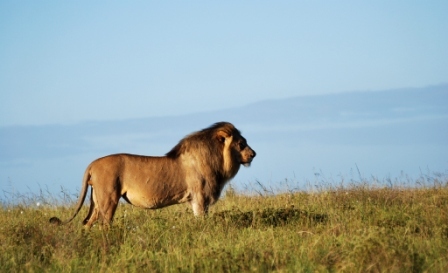 Waking each morning to the sound of Lions near our camp was only one of the many treats at John X Safaris. Traveling is always more interesting when you meet new people. This trip was no exception. On the first evening, at dinner, I met a couple from Franschoek, a small town north of Cape Town. They were Paul and Anne, along with their three children, daughters Georgia Anne and Shannon and their son, Zack. The five of them were staying at Lalibela with their friend, Carla, a young lady who is an exchange student, from Saint Andrews, in Boca, Florida. They, along with our game ranger, David, made the next few days at Lalibela a delight. We were able to view African animals up close and truthfully, they were beyond description. David was knowledgeable and answered all questions without talking down to the young people. David had spent time living with the San people, the bushman’s tribe of Namibia. For three months, his personal teacher was an 89-year-old member of that tribe. I missed seeing them on their last day of game drives, as I went to Grahamstown for the annual Art Festival. I have always enjoyed the local art and exciting street food. While sitting at a food court, I glanced up and there were my new friends. We were able to talk and promise each other that we would keep in touch. I look forward to seeing them on a future trip. Actually, Anna told me that she would like to try hunting. Maybe we will be able to meet on my next trip. While in camp, I also had the pleasure of meeting Stephen and Karen Bassett. Stephen is an award-winning author and artist. He is internationally renowned for his research into the cave paintings of southern Africa. His research into the methods and techniques used by the early cave painters is regarded by academics as some of the best in the modern world. Karen, also an artist, works with Mzamomhle Home Care Centre a charity that assists locals to raise their standard of living. Disadvantaged women and their children seeking to improve their status in society and their African culture receive assistance from this group. One evening, Carl, Jose, and I were invited to a dinner prepared by Lee, Carl’s sister, and her husband, Gary. We enjoyed a meal of wild game, local lamb, chicken, and side dishes. A great evening passed with food, fine wines, and conversation. As the days of relaxing and visiting at Lalibela, attending the local galleries, and dining in restaurants in Grahamstown were coming to an end, I was ready to start my hunt. 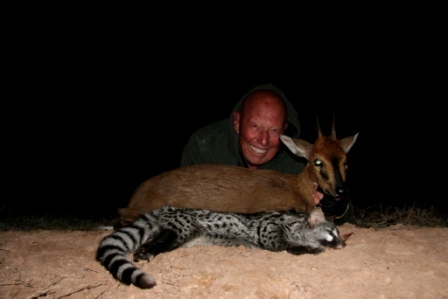 Carl had been away in Johannesburg, attending a meeting of PHASA (Professional Hunters Association of South Africa). Carl serves as a member of PHASA’s Executive Board of Directors, a group dedicated to the high standards of professional hunters in South Africa. My hunt in South Africa. Arriving back at camp, Carl informed me we’ll try an evening hunt on a ranch next door. Eight years ago, the ranch was purchased by a reserve, and has yet to be incorporated as a fully fledged wildlife area. It takes many years for a new purchase to reach its maturity; hunting plays a vital role in the development costs. We went out after dark to hunt for Duiker. After many hours, we returned to the lodge without taking a shot. 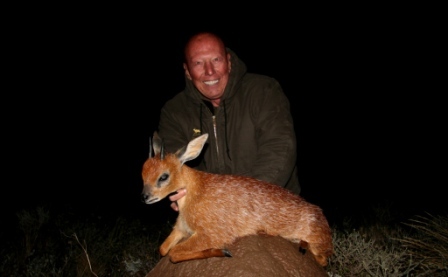 I had hunted for Common Duiker several times and have never had the luck necessary to harvest one. I hope that this trip does not continue my streak of bad luck. Up early the next morning, after a light snack, we are off to the Karoo. 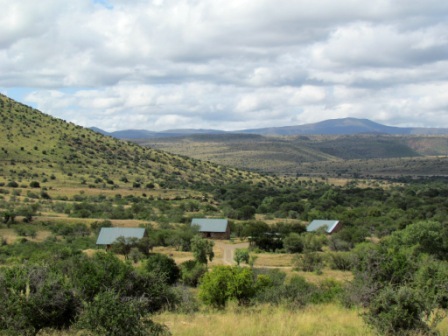 Actually, we are going to Graaf-Reinet, a beautiful old community, and then on to our destination, Glen Harry. After settling in our rooms, we meet Hennie, the manager, and Harry, the camp manager. Discussing what we are looking for over a traditional English breakfast, Carl and Harry set out a plan. In our rooms, we arrange our things and then back to the dining area to leave on my hunt. Carl wants to try for Klipspringer. The Klipspringer is a small mountain antelope that my 73-year-old knees may not be up to the challenge of taking. Of all the tiny ten, the Klipspringer is one trophy that may be beyond my ability. Driving around the ranch, we spot several and decide on one that may be within my ability. The males are always with their ladies, so we have more than one pair of eyes with which to contend. With Carl and Zwayi in front and Jose and Harry and me following, I find the walk is not as hard as I thought and after a short time I think that taking a Klipspringer might be within my capabilities. Two long stalks and many ridges later, I watch the rear ends of the small antelopes disappear over a ridge for the third time. Not as easy as I thought. Back at the truck, Carl suggests we try for a rock Hyrax, a small critter I have wanted for several hunts. Driving in search of Hyrax, we spot two klipspringers, a male and a companion, his mate. Carl continues to drive down the road some two hundred yards and pulls off. He tells me that he has seen this male before and if it’s the same one, it’s a very good one. We need to stalk back under the cover of the trees that line the road to get into a spot where I can take a clean shot. Carl and Jose grab the shooting sticks and the glasses and I grab the W-70 in .243 and head back, hoping to see the antelope still in the open. Clearing the trees from across the area where we saw the Klipspringer, I look up the hillside. I am unable to see anything until Carl hands me his field glasses. Following his guidance, I spot the antelope. He is behind a small brush. I place the cross hairs of the scope on the brush and wait for him to come out. 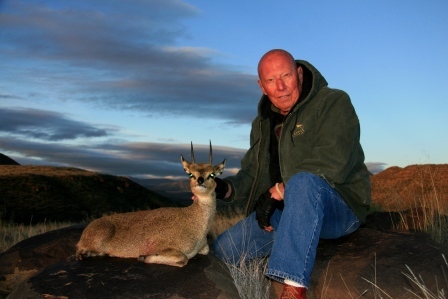 As the antelope clears the brush, Carl says, “Ron, you need to take him now.” Squeezing the trigger, the animal jumps and runs down the hill nearer to us, then turns to our right, and runs back up the hill. This time Carl confirms; “You’ve hit him way too low. Take him when he stops.” The antelope stops on a large boulder. I settle the cross hairs on its shoulder, and squeeze the trigger. With the assistance of my friend and PH, Carl, I have done what I had thought impossible. I had my Klipspringer—old knees and all. And what a beauty he turned out to be! Later in the day, I use Carl’s .22 to take my rock Hyrax. We joked about the Hyrax possibly being the pending world record or gold medal SCI. While it is a very large Hyrax, I am not sure that SCI classifies them. It was however a pretty good laugh listening to Carl and Jose banter on about the world record rabbit! Late that third day, we leave Glen Harry and drive about three hours, through the Sundays River Valley and into the town of Kirkwood. Carl has me staying at a grand old hotel by the name of Kronenhoff. It had been a private home years ago but has been refurbished and converted into a quaint hotel. We have dinner there, with Carl, Jose, and their friends, Francois and Karlien, husband and wife, and friend, CJ. It is a dark and cold night. Shortly after entering the ranch, Carl calls for the truck to stop. To my right, Carl shines the spotlight on a small opening in the brush, hands me the .22 rifle, and says “Watch.” He makes a short chirping sound, and a small animal shows itself in the opening. “Take him.” I shoot, and Carl yells, “You did it!” Did what, I am not sure, but Jose jumps from the truck and grabs a small critter. It turns out to be a small spotted Genet. Later on two sets of eyes are picked up in the spotlight. Looking through binoculars and spotting scope, we confirm one of the two sets of eyes is that of a large Duiker. The antelope is bedded down, and the shot is difficult. I settle the rifle on the target and take my time. After my shot, I am told the animal’s body did not move an inch. I finally have my trophy Duiker. It is an old mature male and while its horns are not the same length, they are heavy from the bases through the ends. A long and cold, but rewarding night it turned out to be. At breakfast the next morning, we decide to try for a Black Springbuck. This is another antelope that I have endured bad luck with in the past. I have done stalks and set up ambushes for them, only to come up short. As the afternoon wears on, a new group of Springbuck come into our area. There is an exceptional common Springbok in the herd; more importantly, there are two large black Springbuck, also. Using the binoculars, Carl checks over the two. As the antelope mill around, I watch, waiting for the go-ahead to be given. Unfortunately, they join a larger group of animals, milling around and passing in front of one another. Then for no apparent reason, the group of mature males moves off to our right. The nice thing is they are now in single file. Then suddenly our opportunity arrives, “The older one is the last one in line. Take him when he stops.” It will be nice if he stops. The group continues to move but at a slow walk, about one hundred yards away. I have been following the large buck, since given the okay to shoot. If they continue walking in the same direction, they will be out of my shooting zone. I feel good about the walking shot and settle the rifle on the shooting sticks. Taking a breath, I take the shot. Carl had been watching through his field glasses and at my shot I hear him whisper, “Perfect.” The animal went right down.” “Great job.” As we walk up to my trophy, I can see that the horns are heavy, from the bases all the way to the tips. I have finally taken my black Springbuck. My bad luck, for whatever reason, has passed. After taking the animal to the skinning shed, we drive up to the main house and set up for our lunch on the lawn between the main house and a large pond. Sitting back with my sandwich and opening a Castle beer, I thought to myself, all is good with the world. After an uneventful afternoon we head off back to base camp and later onto Grahamstown, the four of us discuss what has taken place over the last few days, and also, more importantly, what needs to take place in the next few days. A plan is laid out. Munching on some deep fried jumbo shrimp, on High Street, I buy a small wooden box and an old African mask. My trips to Africa are always enhanced by its people, art, food, and the culture. I truly love this continent. The plan for day six is for me to enjoy a game drive with Dave before heading out after Cape Grysbuck. He’d spotted a Cheetah while coming into camp – the perfect picture opportunity! This morning, besides the Cheetah, we have a chance to see Lions, Elephants, White Rhino, a variety of antelopes, small game, and tons of critters and birds. After a light, but satisfying lunch, we are on our way. We take the N-2 through Port Elizabeth, then south past Jeffereys Bay. Two hours later, reaching Humansdorp, we take a secondary road. Within ten miles, we reach our destination. We need a Grysbuck tonight, Carl reiterates. Driving around in this last area, we see the normal critters and stop to glass several of them. Not what we are looking for. Sitting on the back trying to follow the beam of light, I suddenly spot a flash of movement under the light. Turning to Carl, I ask, “What is it?” “Take him. It’s a Grysbuck!” By the time I get my rifle into action, the small antelope takes off running. I settle my cross hairs on him and then lead him before squeezing the trigger. At the sound of my shot, all hell breaks loose. Carl is hugging me, Jose is slapping my back in congratulations, and Doug, who is driving, is screaming from the cab, “Great, great, great!” I have finally taken my Grysbuck. It is a beautiful antelope, petite, and auburn in color, with gray fur overlying the reddish color. Nine down and one to go. It is right at midnight, when I took my Cape Grysbuck. We have a two-hour drive back to camp, so we say our good-byes to Doug and give our thanks, then head north following the roads we had driven earlier. While Carl steers us home safely, Jose catches a nap on the back seat with Zwayi, and I reflect on my trip. It has been a good one. I have been able to interact with locals, seen great country, been successful in my hunting, and have a trunk full of memories. I’ve come to realize, memories are the most important item trophy hunters take home with them. Once home in the US, I walk through my house and glance at the different trophies I have taken over the years. I look at the art I have collected, and all of them bring back pleasant memories. I look at my Nyala taken in the Limpopo area with P.H. 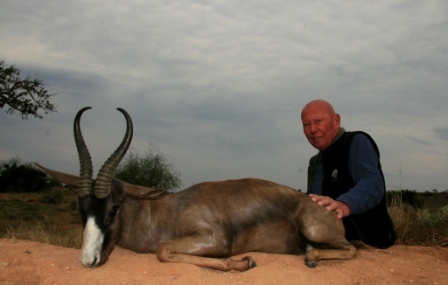 Mynhard Herholdt, the huge Kudu I took with P.H. 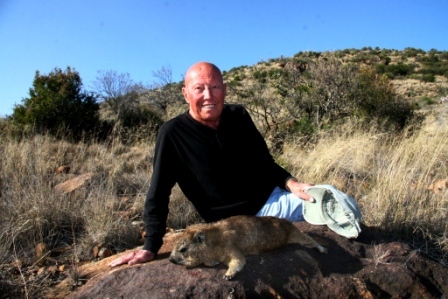 Charlie Joubert and recently, the last-second Cape Grysbuck with P.H. Carl van Zyl. Carl was a youngster when I first met him; I was hunting with his father, Rick, now retired. Carl has developed into a fine professional hunter. He and his lovely wife, Etresia, are expecting their first child, and I expect the business will continue beyond the years that I have allotted for my hunting. Some quiet evening, in my future, I hope to look back at my notes and relive all these exceptional days and nights I spent exploring the Dark Continent. And with some luck I’ll have 10/10 on the Tiny 10 when next you hear from me!